I am fortunate to have an established career with global corporation that allows me the freedom of a flexible schedule. Being able to extend my days off into more than just two days has given me the opportunity to create a life in the food community here in Charlotte. Over the past two years, I created a food blog at the advice of a friend and became the girlfriend of a beer and food photographer. Without knowing exactly what was missing, these two things were the answer. They launched me into the person I have wanted to be for so long. Supporting local restaurants, brands and leaders has always been important to me. I am honored to be considered an influencer in this great city. Taking advantage of my three days off takes some planning. I typically map out a plan to go uptown for some photos, eat at a new place for breakfast and lunch, go for a run on the greenway, stop in Trader Joe's and then try to make it home before rush hour. Eating at a new place on my days off is sometimes challenging. I have favorite spots I like to visit, it's nice to keep to what's familiar when you're rushing around. I need to wear comfortable clothes, stay hydrated, and have all the necessary things for me to have a successful day of hopping around town. My Apple Watch is my only real accessory and at times I forget what it's like to have a "regular" watch. Please tell me you've had those "ghost vibrates" on your wrist when you aren't wearing it, right? It's strange and a clear realization that maybe I should give my wrist a break from the constant updates. Here enteres my new addition, a sleek and super cool wooden watch, byJORD. Sushi is one the most fun things to eat, probably because of the chopsticks and dipping everything in sriracha. Both sriracha and chopsticks are not technically in the "proper" rules of eating sushi. I know that we are not in Japan, but I would like to pretend sometimes. My top three sushi restaurants in Charlotte are Pisces, CO and RuSan's. For a breakdown of the said rules of eating sushi, check out this greatarticle. What I learned most from reading Lisa's piece was that it is considered rude to rub your chopsticks together after breaking them apart. I simply do this to avoid splinters, apparently it comes across as you thinking the utensils are under quality. I will still rub them together, mainly because I don't want a splinter and because the restaurants here don't whittling their own chopsticks. As much as I eat sushi, I should invest in my own pair and carry them around in my purse. My two favorite things about Charlotte are the Little Sugar Creek Greenway and all the breweries we have. The greenway is a great way to get exercise in nature without having to leave the city. Once finished it will be over nineteen miles. Wooden Robot is one of the best in my opinion. Offering a fantastic selection of IPAs, sours, ales and a food vendor that makes every item on their menu with one of their beers. To top off the experience, you have a great view of uptown Charlotte. 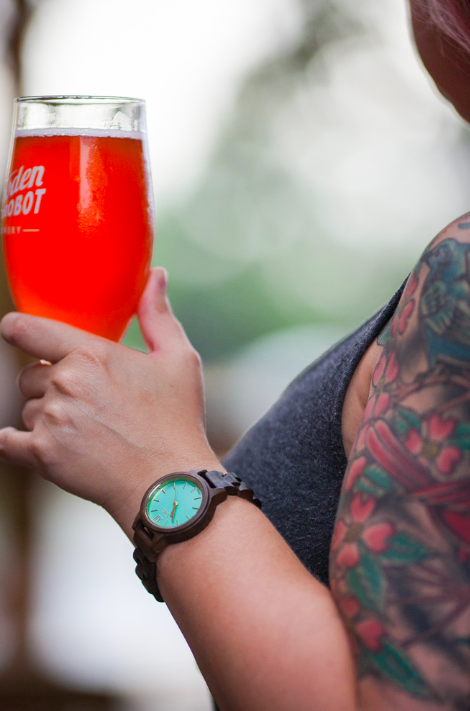 A couple of my other favorite Charlotte breweries are Birdsong and Sycamore. 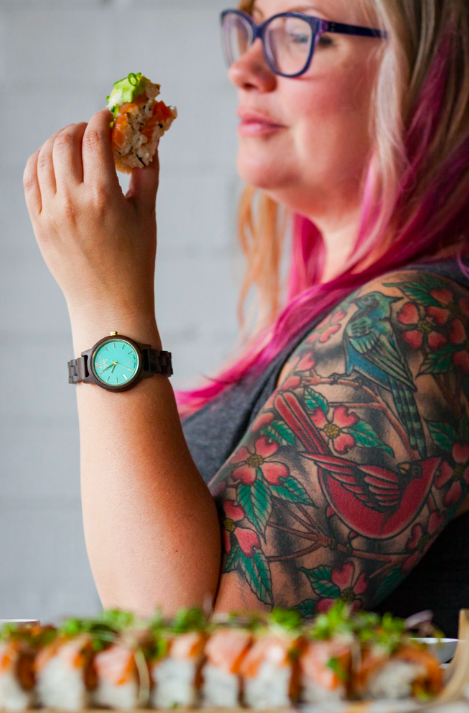 If you've enjoyed my "day in the life of a food blogger" little story and want to know more about my new cool watch, here's a close up photo and alinkto see other men's and women's styles. The watch I'm wearing in these photos is from the Frankie 35 series, "Dark Sandalwood and Mint".